Spend four days learning about and practicing the greatest and oldest sport in the world—track and field! With great facilities and top-notch coaches, you’ll walk away with an unforgettable experience and fine-tuned technique. Regardless of your experience, we have a spot for you at Stars & Stripes Track Camp. Whether you’re looking to learn about all of the events or focus on one, we’ll equip you with the skills to succeed. Stars & Stripes Track Camp is a great place to prepare for your track and field season. Stars & Stripes Track Camp is a 501(c)3 non-profit organization, coached by Olympic and elite athletes. 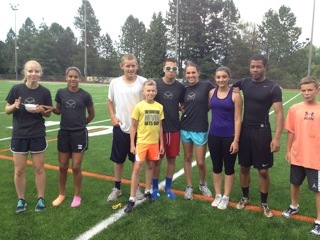 Our day clinic is open to ages 6-18 with any level of track and field experience. We provide world-class instruction in training, technique, nutrition, plyometrics and competition strategies. Our junior camp (ages 6-12) teaches campers about each track and field event and gives each camper an opportunity to grow as an athlete. Our senior camp (ages 13-18) focuses on advanced training and emphasizes technique, drilling, and theoretical aspects of track and field. Both camps offer instruction in the throws, hurdles, jumps, pole vault, and running events at all distances. Our hands-on approach and expertise makes this camp like no other. Our coaches possess a wide range of skills in the sport, are conscious of our camper’s needs, and are equipped with the experience needed to meet those needs. We are confident that your child will leave Stars & Stripes Track Camp a better athlete. It is our desire to provide your child with a track experience that is exciting, fun and most importantly, one that encourages self-esteem. We hope you’ll join us this summer! Stars & Stripes Track Camp provides you with the coaching you need to improve in sprints, hurdles, distance, jumps, and throws. No matter your level or experience, this is an opportunity to learn the secrets of success from track and field Olympians, and have fun doing it.